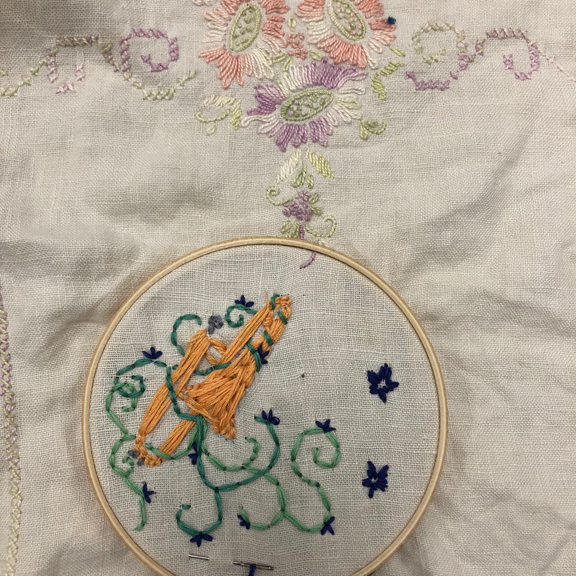 As students continued embroidering over several days, their technique quickly gained sophistication. As the Guest Artist, I wanted artmaking to enhance other art and academic areas. Foraging and learning about the science and chemistry of dyeing while visiting the Farm coordinated with Biology Professor Mark Spiro, who introduced students to the new Farm-in-progress, mentioning opportunities for continued engagement. Multiple walks on successive days to the Bucknell boat launch, although muddy from nearly constant drizzle, became students’ favorite spot. Use of cell phones was nearly absent, except to stream music while embroidering in the classroom. Deep engagement with each other, quiet time outside and the meditation of embroidery absorbed students. This is evident in their handwork, which increased in detail, delicacy and complexity, referencing the natural world and an obvious engagement in the program.